Winston and Pansy Greene at their home in Valencia. 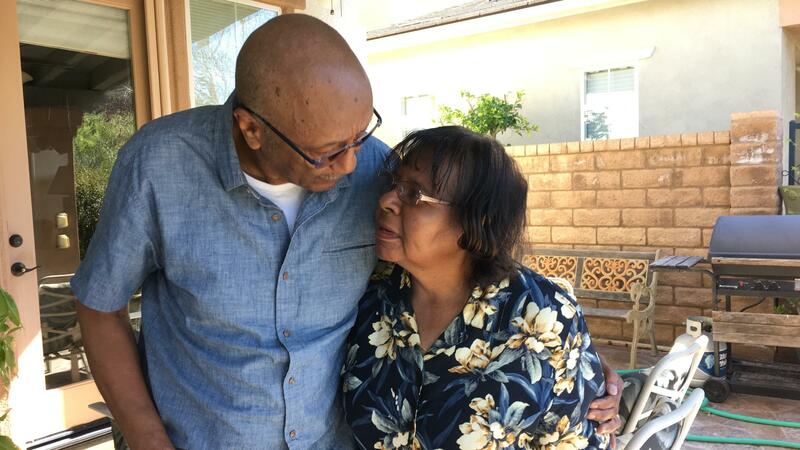 Calif.
Pansy Greene is one of 5.7 million Americans who have Alzheimer's disease. She and her husband Winston call her illness part of their "journey" together. They're doing their best to live a normal life, but they've had to adjust to losses day by day and year by year. For example, Pansy doesn't cook any more. Winston points to the stove in the kitchen of their suburban home, north of Los Angeles. "No knobs," he says. "We just take off all the knobs because with this disease, Pansy might come in and turn [it] on. Gas may be escaping. Anything could happen." Winston calls this one of the "little things" that have changed for the couple since Pansy's diagnosis eight years ago. But the list of "little things" keeps getting longer. Pansy used to talk more. She's pretty quiet now. Pansy used to pay the bills. Now Winston does. She used to do the laundry. That's also Winston's job now, though Pansy doesn't want to hear it. "Since when do you do that?" she asks with irritation in her voice. Winston soothes her: "Well, you do the folding up. You help out too. We do it together." The Greenes have been doing everything together for 61 years. I've stayed in touch with them for the past five. In our first interview in 2013, they told me that they met at a party when Pansy was just 16 and Winston was 18. "And he didn't let go of me the whole night. He wouldn't let anybody else dance with me," she laughed. Winston recalled, "I had just moved here from New York and I thought I was better than sliced bread." They married not long after they met, raised three daughters, and spent decades working in the aerospace industry. Pansy worked on the space shuttle, Winston on the B-1 bomber. Now, at the age of 80, his full time job is making sure that he and Pansy have days that are as full as he can make them. So five days a week, they have lunch at the Santa Clarita Valley senior center. It's a lively place where a diverse crowd of older adults gather at long tables to dine and schmooze. There's even live entertainment, as the musicians in the crowd take advantage of the piano in the corner. Winston explains to his lunch companions why they're letting me tag along. "It's not for us," he assures them. Talking to me is part of his and Pansy's mission to raise awareness of Alzheimer's disease, particularly for other African-Americans, who are especially at risk. "Too many people have Alzheimer's and it's hush hush," he says, adding that he and Pansy can help people just "by being advocates and talking about it." Winston could probably make sandwiches at home. But he knows that the social stimulation here is important for Pansy. And she does perk up. She smiles. She gets chatty. She gets curious. She wants to know how I am. She wants to know what my recording equipment is for. She says she likes seeing the people here every day. It can be tiring, but she persists "to make myself more spiritual to God." Winston notices the difference in her. You're doing a lot of talking, he tells her. "I've got to think of things to talk about so we can talk all day long." Pansy laughs. "Not too much," she teases. She still has the power to charm him. "Okay," Winston says, "not too much. Just enough." Winston knows it's important to keep Pansy physically and mentally active. So in the afternoons, they walk and listen to music. Sometimes they attend support groups. Then it's time for dinner and another opportunity to bond over a meal. This time it's with the family. Five nights a week the Greenes have dinner at the home of their daughter and son-in-law, Antoinette and Shane Ferris. Antoinette explains that her husband is the cook in the family. "He's actually a chef," she says. "Went to culinary school and all that good stuff." Winston says dinners here are the reason that he and Pansy moved close by. "Shane said, 'you come out, you'll never have to cook another meal." Shane deadpans, "I still don't' remember saying that." There's a full house. Shane and Antoinette's 13-year-old son, Aiden, and 26-year-old daughter, Alexia are at the table. The two dogs and three cats just wish they were. Pansy doesn't join in the conversation much. So Winston checks in with her from time to time. "Nothing's bothering you today? " he asks. "No," she says, "nothing's bothering me today. " But she adds, "Sometimes it's difficult because I'm not sure what I'm doing." Then she trails off in a few unintelligible syllables. That's been happening more frequently says Antoinette. "Getting the words out and speaking in legible sentences is one thing that's just come up in the last few months," she says. It's happening "so much more than before." Maybe that's another one of what Winston calls "the little things." He keeps his focus on what really matters to him. "Even though [we're] going through this, Pansy and I are still here. We're together. We are a couple." And that's what makes life normal for the Greenes, even though with Alzheimer's, it's a new kind of normal every day. Now we check in on the Greenes. Pansy is one of the 5.7 million Americans with Alzheimer's disease. She and her husband Winston call her illness part of their journey together. We first met the Greenes in 2013 when they talked about having to make adjustments in their daily lives. WINSTON GREENE: I don't have to say oh, well, baby, I - you just told me that, or I just told you that. You know, and that's what I had to really work on myself. PANSY GREENE: And I just said, well, just be patient with me. I just forgot. That's all I can do. SIMON: NPR's Ina Jaffe covers aging. She reports that the Greenes continue to adjust to losses one by one. And day by day, they're doing their best to hang on to what's left of normal. INA JAFFE, BYLINE: A meal can be so much more than sustenance. It gives structure to the day. It's a way to bond with family and friends. But Pansy Greene doesn't cook anymore. Her husband Winston stands in the kitchen of their suburban home and points to the stove. W. GREENE: No knobs. We just take off all the knobs because with this disease, Pansy might come in and turn on - gas may be escaping. Anything could happen. JAFFE: Winston calls this one of the little things they've lost. But the list of little things keeps getting longer. Pansy used to talk more. She's pretty quiet now. Pansy used to pay the bills. Now Winston does. She used to do the laundry. That's also Winston's job now, though Pansy doesn't want to hear it. P. GREENE: Since when do you do that? W. GREENE: ...Well, you do the folding up. You help out, too. We do it together. JAFFE: The Greenes have been doing everything together for 61 years. In our first interview in 2013, they explained that they met at a party when Pansy was just 16 and Winston was 18. P. GREENE: He wouldn't let anybody else dance with me (laughter). W. GREENE: You know, I had just moved here from New York, and I thought I was better than sliced bread. JAFFE: They married not long after they met, raised three daughters and spent decades working in the aerospace industry - Pansy on the space shuttle, Winston on the B-1 bomber. Now, at the age of 80, his full-time job is making sure that he and Pansy have days that are as full as he can make them, which is why five days a week, they have lunch at the Santa Clarita Valley Senior Center. W. GREENE: So, Hilda, you remember we said we was bringing someone here? JAFFE: Winston explains to his lunch companions that the reporter tagging along is just a part of his and Pansy's efforts to raise awareness of Alzheimer's disease, particularly for other African-Americans, who are especially at risk. W. GREENE: Because there's too many people that have Alzheimer's and everything is hush-hush. And so by being advocates and talking about it, it may help anybody. JAFFE: Winston could probably make sandwiches at home, but he knows that the social stimulation here is important for Pansy. And she does perk up. She smiles. She gets chatty. P. GREENE: How you doing? JAFFE: I'm doing well. How are you doing? P. GREENE: I'm doing good. JAFFE: Do you like seeing these people every day? P. GREENE: Now, I do. P. GREENE: I do, but sometimes I get tired. But anyway, I get up to make myself more spiritual to God. So that's the way I try to take it. JAFFE: Winston notices the difference. You're doing a lot of talking, he tells her. P. GREENE: I like it. W. GREENE: I know. I like it, too. W. GREENE: I've got to think about stuff to talk about so we can talk all day long. P. GREENE: Well, don't do it too much. W. GREENE: Not too much? OK.
JAFFE: Winston knows it's also important to keep Pansy physically and mentally active, so in the afternoons they walk and listen to music. Sometimes they attend support groups. Dinnertime is another opportunity to bond over a meal. SHANE FERRIS: All right, this is for grandma. JAFFE: Their son-in-law Shane Ferris sets a plate of roast beef, mashed potatoes and veggies in front of Pansy. Five nights a week, she and Winston have dinner at the home of Shane and their daughter Antoinette Ferris, who explains that Shane is the cook in the family. ANTOINETTE FERRIS: He's actually a chef. He went to culinary school and all that good stuff. JAFFE: Winston says dinners here are the reason that he and Pansy moved close by. W. GREENE: Shane said you come out, you'll never have to cook another meal. S. FERRIS: And I still don't remember saying that. That's the thing. JAFFE: He's joking, of course. S. FERRIS: They're a great mom and dad. We got along from Day 1. Plus, you know the old saying - happy wife, happy life. JAFFE: There's a full house. Shane and Antoinette's 13-year-old son Aiden and 26-year-old daughter Alexia are at the table. Two dogs and three cats just wish they were. Pansy doesn't join in the conversation much, so Winston checks in with her from time to time. W. GREENE: Nothing bothering you today? P. GREENE: No, nothing's bothering me today. P. GREENE: Sometimes it's difficult because I'm not sure what I'm doing. But most of the time I get a (unintelligible). JAFFE: That last little bit wasn't really a word. Antoinette says these lapses in speech are happening more frequently. A. FERRIS: Getting the words out and speaking in legible sentences is one thing that's just come up over in the last few months, huh? Yeah, so much more than before. JAFFE: Maybe that's another one of what Winston calls the little things. He's focused on what really matters. W. GREENE: Even though going through this, Pansy and I are still here. We're together. We are a couple. JAFFE: And that's what makes life normal, even though with Alzheimer's it's a different kind of normal every day. Ina Jaffe, NPR News. Transcript provided by NPR, Copyright NPR.